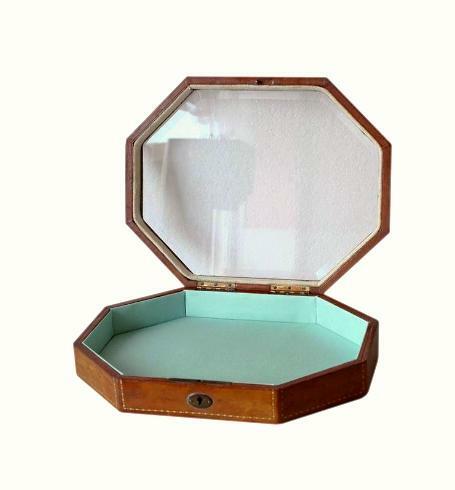 This is a stylish vintage jewellery box, dating to the 1950s. 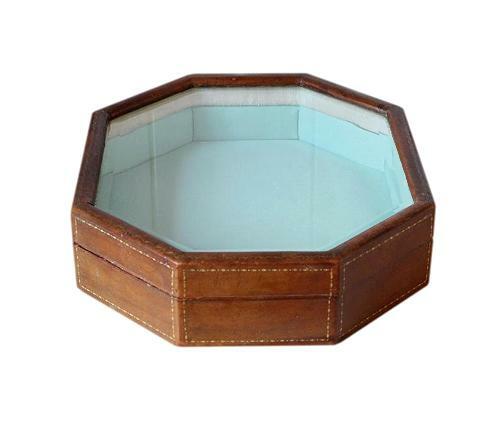 It has a glass lid, a genuine Moroccan leather finish on all sides, and a beautiful refurbished interior. 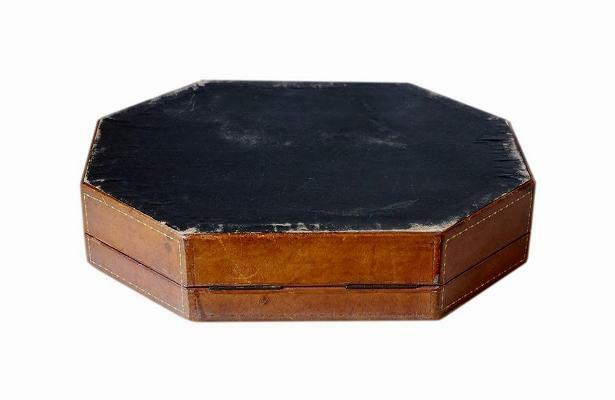 This box has an unusual elongated octagonal shape. It has a dark tan leather finish on all 8 sides. The leather has beautiful tooled decoration with gilt detail. 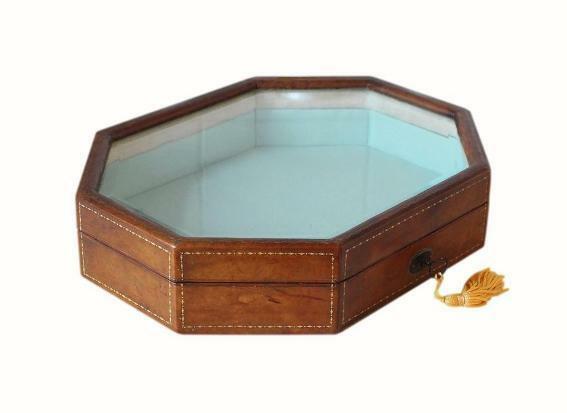 The lid has a beautiful large glass panel with bevelled edges. This allows you to see whatever jewellery is stored in the interior compartment. The box is complete with its original working lock and key. It also has its original 'stop' hinges which prevent the lid from falling back. There is a stylish oval metal escutcheon to the keyhole. The bottom of the box has its original vinyl covering. The vinyl has a faint hand written inscription which reads 'Anne Dawson, Sonny's Wife'. This is probably a previous owner of the box and is a nice little snippet of its history. The interior compartment has been beautifully refurbished by our skilled box restorer. It has a new padded satin panel in the base, and new satin linings to the interior walls. The satin is a beautiful pastel teal blue shade. The interior walls of the lid have their original light beige velvet linings. are already very old and will naturally have some wear from age and use. We are not responsible for locks that malfunction from further age and use once boxes are purchased. 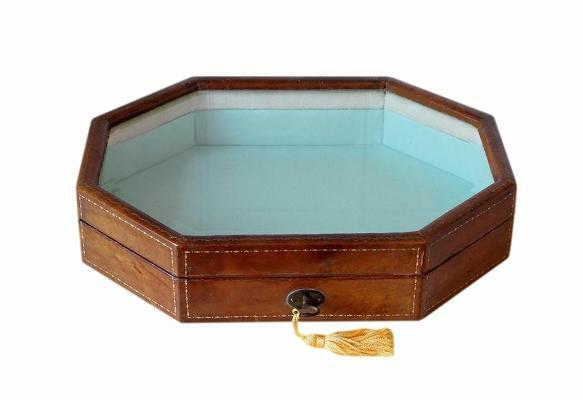 This wonderful box is in excellent condition for its 60 plus years of age. There is minor light age related wear to the leather. There is some friction wear to the vinyl on the bottom of the box. This is as we'd expect on a box of this age. The interior satin, being new, is in excellent unworn condition. The original velvet linings to the lid are very good with no splits or fraying. The glass is clean and has no cracks or scratches. The hinges and lock are in good working order. 26.2 by 20.2cm with a 3.2cm depth. Please Note that a surcharge of £15.00 will be added to the £25.00 international postage fee for this box, because of its size and weight. Please contact us BEFORE ordering so that we can add the surcharge for you.